There is nothing more fun then heading out to the s﻿﻿ho﻿﻿oting range. And it's a whole lot easier when you have the best range bag to keep your gear squared away. You got all excited, gathered up some gear, and took off for the closest gun range. Once you're there, you get situated and you're locked, loaded, and ready. It hits you, you forgot eye protection. If not that, you forgot ear protection. Or wait, you don't have a stapler for your paper targets, and the range ran out. There always seems to be something missing. The good news is that with the right bag, you can keep your gear organized so that it's easy to know that you have everything that you need at the range. You also have plenty of space to bring some spare eye and ear protection, as well as tape and a stapler. 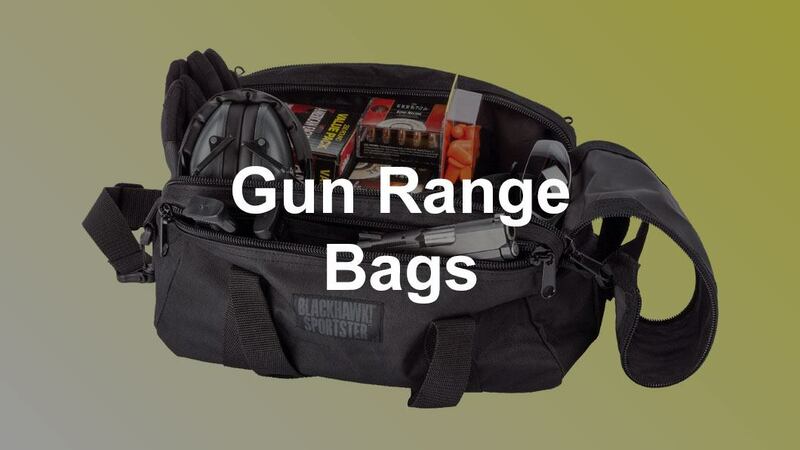 Regardless of whether you are an experienced marksman or brand new to the world of firearm ownership, you should consider purchasing a quality range bag. 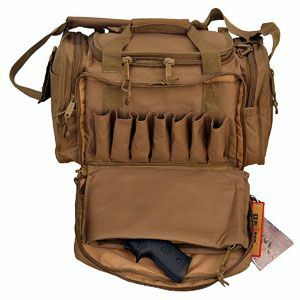 A range bag is used to transport guns, ammunition, cleaning supplies, tools, and other essential items to and from your preferred shooting range. Your individual needs will vary based on the size and quantity of firearms that you have, but if you own one or more pistols, these are the top 10 gun range bags that you should consider. This mid-sized range bag measures 16” x 8” x 7” and comes with all the key features you need in a convenient package. The main compartment runs the length of the bag and is secured by a roll-up zippered flap. The zippers are connected by a pull handle, allowing quick access to the bag’s interior. Inside the main compartment, moveable hook-and-loop dividers allow you to organize your ammunition, cleaning supplies, and other essentials to meet your needs. There are two lockable zippered compartments running parallel to the main compartment. Each compartment contains a removable, padded pistol rug. 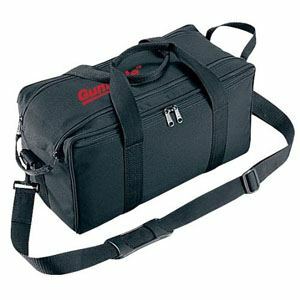 Durable carry handles and an adjustable shoulder strap are also included. 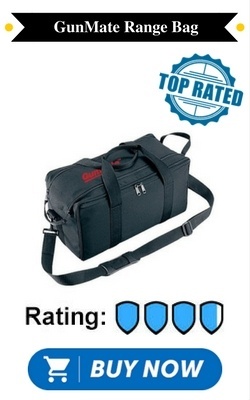 The features of this bag at an amazingly low price make it the most popular option. Designed with input from range instructors, special operations experts, and law enforcement personnel, the Explorer Tactical Range Ready Bag has everything you need in a range bag and more. Measuring 18” x 14” x 10”, this durable 600-denier polyester bag is ruggedly constructed to withstand long-term use. Moveable dividers in the main compartment keep you organized. The two exterior zippered pistol pouches feature a total of eleven magazine pouches. All compartments are padded to protect your gear. The carry handles are triple-stitched to ensure this bag can hold the weight of your firearms, ammunition, and accessories. All of the zippers are high-quality. The bottom of the bag even has plastic feet to protect it from wear. 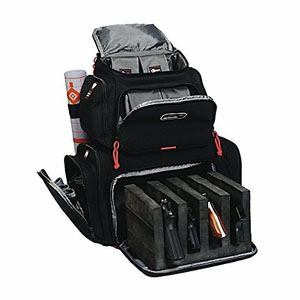 In the Osage River Tactical Range Bag, there is a place for everything. It has nine storage compartments, including two removable padded pistol pouches, a large main compartment with moveable dividers, and five zippered compartments on the exterior. A total of fourteen magazine pouches ensure that you will never have to look for a loose magazine again. It is made from 600-denier ballistic nylon and has heavy duty zippers with easy-open pulls. The standard range bag measures 18” x 13” x 10” while the smaller “light duty” version measures 13.5” x 10.5” x 7.5”. Osage River’s products are covered by a lifetime warranty which states that if it breaks, they will fix or replace it at no charge. Measuring 16” x 9” x 11”, the Explorer Tactical 12 Pistol Bag was designed with law enforcement personnel and tactical operators in mind. The Tactical 12 is made of 1000-denier ballistic nylon, and all thirteen compartments are padded for maximum protection of your gear. 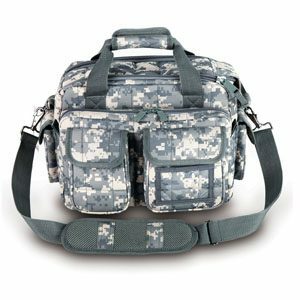 The main compartment features two dedicated weapons pouches with center support straps and a sizeable storage area for ammunition, hearing and eye protection, cleaning supplies, and more. 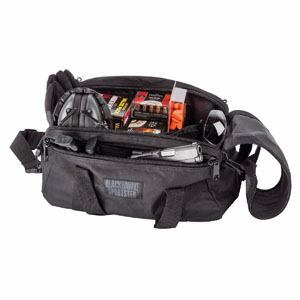 All exterior compartments are loaded with pockets, pouches, and gear loops for magazines, tools, and a plethora of other items. 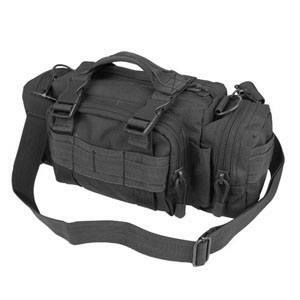 The Sportster Pistol Range Bag by Blackhawk is a simple, durable, and effective range bag made from 600-denier polyester. 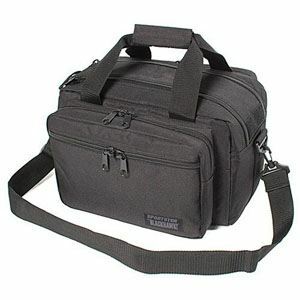 Measuring 16” x 9” x 8 “, it features one large main compartment accessible by quick-pull zippers on a roll-up flap with plenty of room for storing ammunition and other supplies. Two exterior slash compartments provide ample room for pistols and magazines without adding bulk to the bag’s overall dimensions. Heavy-duty, self-healing coil zippers and tactical web handles are standard on this bag, as well as MOLLE webbing for attaching additional compartments and gear. A compact, efficient and rugged bag that measures 12” x 5.5” x 6”, the Condor Deployment Bag provides you with just enough storage for the essentials. MOLLE webbing on all four sides gives you the ability to add more pouches if needed. Its minimalist design and small footprint make it an ideal choice for those who want a discreet range bag. Three zippered exterior compartments provide storage for tools and magazines. The main compartment has side pouches on the interior. Buckled compression straps, an adjustable and removable shoulder strap, and a webbed handle provide you with multiple carry options. The GPS Handgunner Backpack is a great bag for people who like to bring all of their own equipment to the range. Designed for users with multiple handguns, the base of the backpack has a compartment that holds up to four pistols side-by-side, sitting vertically in a foam cradle that slides out of the backpack. Pouches on either side of the backpack provide storage for twelve magazines. While four additional compartments above those give you plenty of room to transport ammunition, eye and ear protection, targets, shooting mats, binoculars, cleaning supplies, and tools. Glock pistols are the most popular semi-automatic pistols on the planet because they are simple, reliable, and effective. Their Single Pistol range bag is designed just like their pistols, which means high quality and awesome functionality. Measuring in at 12” x 8”, this slim-lined glock range bag gives you everything you need to bring your firearm to the range. The main zippered compartment features a padded pocket for your handgun, four magazine holders, and just enough room for a box of ammunition. A small exterior zippered pocket gives you a place to keep a few small tools. The durable nylon carry handles are continuous pieces that wrap completely around the underside of the bag and provide plenty of support. The 5.11 team designed their Tactical Range bag with specific input from firearm instructors and professional shooters. If you make frequent trips to the range, this bag should definitely be on your list to check out. 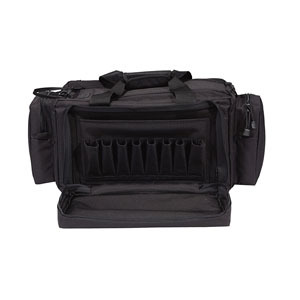 Measuring in at 21” x 14” x 10”, this rugged range bag can accommodate multiple pistols. The main pocket contains a large, removable ammunition tote that can handle as much as you can fit in it. The zippered front organizer pocket has eight magazine pouches. 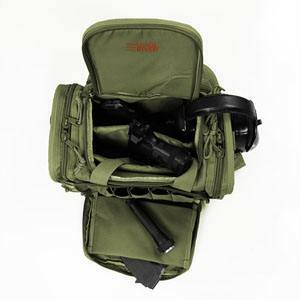 The spacious side pockets provide a place for storing ear protection, optics, and supplies. It even comes with a hydration pocket so you do not get parched while shooting. A padded shoulder strap makes it comfortable to carry everything. The slightly bigger brother of the Sportster Range Bag, the Blackhawk Sportster Deluxe is made from the same rugged 600-denier polymer. However, it offers more storage capacity than its sibling. The large interior compartment, like the Sportster Range, has quick-pull zippers and a roll-up top flap. The Deluxe also adds two large zippered exterior pouches and a single slash pouch to the mix, giving you more room for magazines, tools, and cleaning supplies. 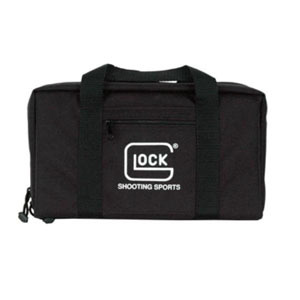 Measuring 15” x 11” x 10”, this bag comes with a removable gun rug with internal soft fabric to protect your firearm’s finish. When you go to the range, you want to make sure that you have everything you need to have a great time shooting. That's where a great shooting range bag comes in handy. With the right size, well laid out compartments, and easy ability to carry, it is the best way to keep your gear nice and squared away. We reviewed the top 10 options out there and discussed why they are the perfect fit, depending on your preferences. If you are thinking about shooting longer distances, make sure you have the right scope for your rifle. We have a great guide here.